Do you want compensation? Were you a victim of institutional child sexual abuse? 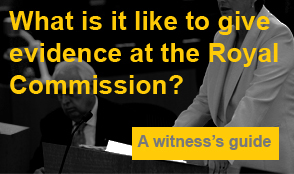 If you would like Peter Kelso to represent you at the Royal Commission, please register your interest by entering your details online at http://royalcommission.rb.com.au/contact/. To receive regular updates on the Royal Commission, please subscribe to Peter Kelso’s e-newsletter.